Are you having a hard time making your plant or crop survive in your garden? It takes patience and knowledge to get those flowers blooming and eggplants healthy so don’t just give up. Know what your plants need for nourishment. It could get tricky especially if you do not know where to begin. Fertilizers are definitely a big help but do you know it’s possible to over and under fertilize? Now don’t worry if this all sounds complicated because luckily, you can quickly test your soils with kits and devices available in your favorite gardening shop. Let’s take a look at the best soil test kits available in the market that can help you know what your plants really need. Among all test kits or meters available out there, I find the Luster Leaf 1601 Rapitest Soil Tes Kit as fun and accurate way of testing your soil. This Is also very easy to use so if you’re new to gardening, this will get you easily accustomed to soil testing. It’s one of the best products out there that can give you results in just a few minutes. Like humans, plants need nourishment too. Its nourishment can come from the light, water, minerals or vitamins. There are a few simple things you can do to ensure your plants are well-nourished. Simple stuff like watering them and exposing them to sunlight are both important, but for healthier plants, you may want to use fertilizers and other mixes available in the market. Now what you have to know is what specific mineral and nutrients your plant needs. This is where test kits come in. It lets you know which fertilizer to use or what kind of adjustment is needed. Soil test kits could measure the soil’s PH, TDS, EC, temperature and even moisture. The soil PH is one of the most common reasons why there is a need to test the soil for your plants. The PH level will tell you whether your plant is acidic or has more alkaline. PH level can be measured from 0-14. If your soil is below 7, then it’s acidic. If it's above 7, then you have a soil with more alkaline. Some soils are only at a 7, which is the neutral PH level. Measuring for the soil’s PH level is a way for us to know which plant is best to plant or what we should do to change and adjust it accordingly based on what type of plant we want to grow. A few examples of plants that need acidic soil are Camellias, Gardenias, and Beech Trees. Some alkaline-loving plants are Photinia, Boston Ivy, and Swiss Chard. Measuring the soil’s TDS or Total Dissolved solids lets us know how much fertilizer your soil already has. This is the best way to tell whether we are over-fertilizing our soils or not. Testing for EC or Electrical Conductivity means knowing how much salt or salinity the soil has. It tells a lot about the soil’s health. The soil’s temperature is also important to measure. It also lets us know what crops or plants we can grow with the soil we have. Certain plants only survive on specific temperature ranges. Measuring the soil’s temperature during the day and night is something to really consider. There are kits or meters out there that require your soil to be muddy inconsistency for accurate testing and results. What you have to consider is that the water you’ll use has a neutral PH level which is 7. Like how it works with soils, anything lower than the PH level of 7 is already acidic and higher than that is alkaline. You can use tap water for testing the Soil’s PH, but this really depends on your area. The usual PH level range of water systems would be 6.5-8.5. That’s not really bad, but if you really want your test to produce the best result, you can just use distilled water since it has the most neutral PH level. If you consider your soil fine-textured, then you wouldn’t have to worry about the PH level of the water you will use. The fine-textured soil is highly resistant to PH level changes to be caused by water. There are two types of soil testers out there. Here is a rundown of what you may encounter when shopping for soil test kits. This type of tester will make you feel like a scientist. Chemical testers are usually available as kits that include a vial, solution, and a chart. It’s pretty easy to use. You just take a sample, put it in the vial with a certain amount of solution and wait for the results that you can compare with a chart. The most probable issue you may experience is that you may have a hard time interpreting the results. The accuracy of this type of kit is not exactly specific. For some kits available in the market, it will seem like you’re just getting a rough estimate of what you’re looking for. This type of tester is also quick and easy to use. You can just quickly stick the probe it comes with to the soil or ground you are testing, and it will easily display the measurement you’re looking for. This type of meter runs on batteries. The accuracy of this type of meter relies on how you’ll conduct your test. The best way to do it is to make the consistency of the soil you’ll measure muddy. Some testing meters come with solutions that are necessary for an accurate result. Aside from the two popular types of soil testers, there are also other ways or method for you to get the measurement you want. First is testing without any meters at all using household products like vinegar and baking soda. The other way is for you to take a sample and have it tested by a professional in a lab. Well, the latter is the better choice if you have a lot of soil to test and you don’t mind spending for the results. 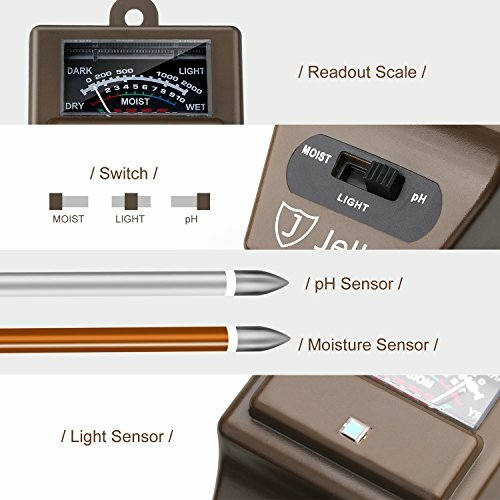 What to Look for in a Soil Tester? Now that we know what tests we can do on our soils, the instrument we will need for measuring what needs to be is very important. A lot of soil tester manufacturers already make sure that you get your money’s worth by releasing multi-testing meters. Don’t be fooled or easily impressed though. It’s possible that some of its functionality is not really something you need. Another thing you may want to check is whether the meter or kit you will get is suitable for either or both indoor and outdoor gardening. Well, this really shouldn’t bother you much since most meters available out there already work for both. Let me give you the most important functions you should be looking for. PH Readings – testing for the soil’s PH is something you can just ignore. It’s one of the main reasons why soil testing meters even had to be invented. It’s basic functionality that all meters should have.Temperature Readings – If you want to know whether your plant will survive in your area or not, then reading the soil temperature is handy. Conductivity Readings – If you plan on fertilizing your soil, then this is very important. Now let’s move on to what products are worth getting when it comes to testing your soil. Whether you’re checking for the soil’s PH, potassium, nitrogen, or moisture, I got that covered. This kit can easily measure the basics of your soil like the PH, K, N, and P. I find this very cute and easy to use. It comes with capsules that contain the powder you’ll mix with your sample and water. It only takes about 10 minutes for you to get all four results. The container it comes with is reusable but just make sure it’s cleaned adequately after usage so that your next tests will be accurate. The challenge with this kit is cleaning up the containers since they are all small. A finger wouldn’t even fit where your soil will go in the container, so be prepared with a tiny brush, like the ones used for reusable straws. This is best for people who are just starting out with gardening. It’s quick and straight-forward. The kit is said to be good for 40 tests. There are 10 capsules available for each component to be tested. It’s is excellent for multiple sampling and immediate results. The Soil Savvy Test Kit will help you get a professional-grade result when it comes to measuring your soil’s PH, nutrients, and components. The good thing about this test kit is that the results come with fertilizer recommendations, both synthetic and organic. This kit comes with a container that has a solution, a scoop, a free return package and of course the instructions that are very easy to follow. 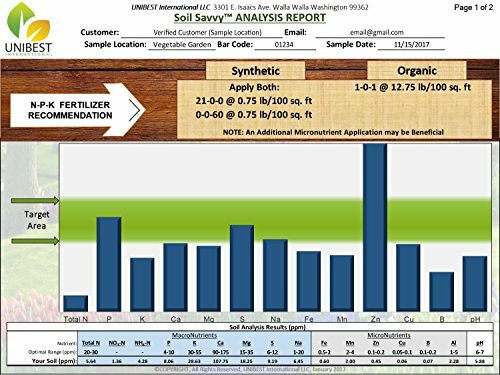 You have the option to receive a printed result or just view it on Soil Savvy’s website after five days. This is recommended if you have the time to wait for a detailed soil test results. The only downside of this product is that the kit only comes with one container so if you have a spacious garden, you can only test for one area unless you buy more of this kit. 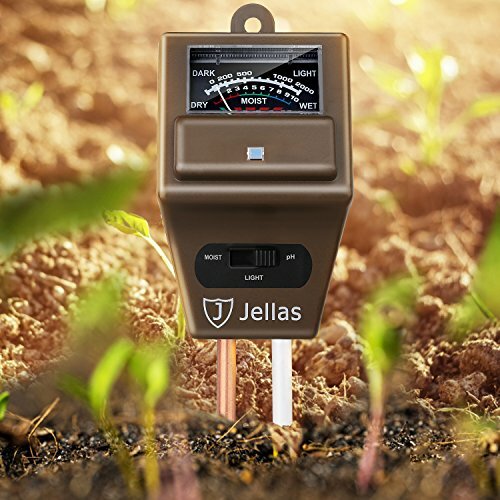 This 3-in-1 meter measures your soil’s PH, moisture and sunlight. It’s a very straightforward device, and it’s also easy to use. It’s your typical meter that comes with a dual probe or needle for a more accurate result. Unlike other soil test meters, the instruction on how to use this device is to simply stick it to the ground or area that you want to test and wait on the display meter to interpret the results. This is good for you if you prefer getting the results right away and if you don’t really need any help from professionals. I suggest that you only use this meter if you are only testing for pure soil. It doesn’t really work correctly with stony soils, like the ones used for succulents or bonsais. I also clean it up before I measure a sample to ensure that I get accurate results. Also, do not leave this planted in the soil for too long as that could damage its probe. This kit measures your soil’s PH, N, P, and K. It also brings the fun in testing your soil. The moment you get this kit, you’ll feel like a pro on a mission. The kit itself is stored in a small plastic case with tools, vials, solutions, and instruction cards. The Rapitest Premium Soil Test Kit is said to be good for 80 tests - 20 for each soil component it measures (PH, N, P, and K). It may not exactly last for 80 tests, but considering its price, it’s also worth it. This kit is only recommended if you have the time to learn how to use it. I wouldn’t say that this is something that’s straight-forward to use. If you plan on gardening with your kids, this may add some science fun to it. This is another test kit that covers the 4 basics of soil testing. These are test strips, so it’s pretty much the same with those lithium paper tests you did back in school. It’s simple to use, but when it comes to accuracy, it only gives you ranges, compared to other testing kits that give you more specific measurements. The kit comes with strips and a chart where you can compare the result. The good thing about it is that it also includes a soil treatment guide you may use once you’ve figured out your soil’s basic components. The chart comes separately so make sure you don’t lose it before finishing all the strips it comes with. This is only best for novice gardeners who are only looking for estimated results. The main challenge with using test strips is interpreting the result since it can be confusing. What do I do if my soil’s pH isn’t ideal? How can I fix it? If you found out that your soil is too acidic and doesn’t fit what your plant or crop needs, it’s easy to adjust its PH level. Putting lime juice to your soil would help increase its PH level. However, if you need acidic soil and your soil has more alkaline, you can easily get soil sulfur that you could mix with your soil to increase its alkalinity. Will adding coffee grounds to my garden affect the pH of my soil? This depends on the coffee grounds you will use. The main purpose of adding coffee grounds to your soil is to increase its Nitrogen level, but if you have unwashed coffee grounds, that could help decrease your soil’s PH level or make it more acidic. NPK stands for three elements: Nitrogen, Phosphorus, and Potassium. These three key elements are essential when it comes to nourishing your plants and crops. There are a lot of NPK fertilizers out there that you can choose from. Just make sure you know what your soil needs first before using one. Are at-home testing kits accurate enough to be worth my time? At-home testing kits are both known to be used by novice and even professional gardeners. Definitely, using these type of testing kits are worth your time and budget as it could be less expensive to do soil tests on your own. After all, a lot of kits and meters out there are already accurate enough. Can I use my soil pH tester to test the pH of my water? If you’re only looking for an estimate when it comes to measuring your water’s PH, then you may try and use your soil PH testers. Even though it could not be that accurate to use these testers on just water, it’s more suggested to use test strips in this case.